Read and listen to the dialog. Vanessa: I did the stupidest thing the other day. I’m embarrassed to even talk about it. Louis: Haha, come on, fess up! What’d you do? Vanessa: Remember I told you about how my boss always talks down to me and treats me like I’m incompetent? Louis: Yeah, and I said you should speak up – it’s not right to treat an employee like that. Vanessa: Well, I didn’t want to cause any problems, so I usually just try to tune him out. But yesterday I finally got fed up and called him out on it – respectfully, of course. I just pointed out that I’ve been with the company for two years and he doesn’t need to spell out every single task as if I were a child. Louis: Oooh, good for you! How’d he react? Vanessa: He didn’t even let me finish! He cut me off and said I was challenging his authority. Then he rattled off all his own accomplishments and started harping on the importance of new employees needing to respect the company hierarchy. Louis: Ugh – so did you keep quiet or tell him off? Vanessa: Before I could say anything, another colleague of mine butted in – I thought she was going to stand up for me, but she backed him up instead! That really stung, because I had opened up to her about my frustrations and she had promised to help me out. Louis: So… I don’t get it. What was the stupid part? Louis: Let me guess – your boss was right there. Louis: How much did he overhear? Vanessa: Enough to make him furious, although he was trying not to let on because he was having dinner with his wife and kids. But I could tell by the look on his face that he’s definitely going to bring up my “attitude problem” at the next performance review. Louis: Ouch. Well, lesson learned – always check your surroundings before you start to vent! Vanessa is hesitant to talk about the stupid thing she did, and Louis tells her to fess up. The phrasal verb fess up is an informal way to say “confess” – admit that you did something bad or wrong. Earlier, Vanessa had told Louis that her boss talks down to her. To talk down to (someone) means to talk to them as if they were inferior, stupid, or incompetent. Louis had encouraged Vanessa to speak up – that means to say your opinion about something you believe is wrong, without fear or hesitation. There’s another related phrasal verb, speak out on/against (an issue), which is often used for speaking publicly about controversial issues. Speak up is used more for personal conversations or discussions in a small group, and speak out is used more for public statements. Vanessa usually tries to tune her boss out – that means to ignore him and pretend she doesn’t hear him. But yesterday she got sick and tired of being treated badly, so she finally called him out – to call (someone) out means to challenge or confront the person, especially about something they are doing wrong. She pointed out that she already has two years’ experience in the company. To point out means to call attention to a particular fact. She doesn’t need her boss to spell everything out for her – to spell (information) out means to describe or explain it very carefully in a detailed and meticulous way. Unfortunately, her boss didn’t listen – he cut her off. In the context of a conversation, to cut (someone) off means to interrupt the person in the middle of a sentence. He then rattled off his accomplishments – to rattle off information means to say a list of things very quickly. Then he started harping on the importance of respect for the company hierarchy. To harp on a topic means to emphasize it or say it repeatedly in an annoying way. Louis asks, “Did you keep quiet or tell him off?” To tell (someone) off means to say exactly what you think about that person (when you have a negative opinion of them). Vanessa had hoped this colleague would stand up for her. Stand up for or stick up for means to defend or support someone or something in the face of opposition. However, the colleague took the boss’ side – she backed him up – to back someone up means to support that person. Vanessa was disappointed because she had opened up to this colleague about her frustrations with the boss. To open up to (someone) means to tell them your feelings, especially things that you had previously hidden. Later, Vanessa was ranting about her boss to her best friend. To rant about something means to complain loudly and angrily. Suddenly, her friend blurted out, “Look behind you!” The phrasal verb blurt out means to say something quickly and spontaneously, often without thinking. The boss was furious, but he was trying not to let on because he was with his family. Not let on means not allowing other people to know about something. It is almost always used in the negative, when someone is trying to hide their emotions or keep some fact secret. But Vanessa knows the boss will probably bring up her attitude at her next performance review. To bring up (a topic) means to introduce it into a conversation or discussion. 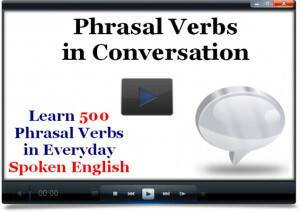 You now know 20 new phrasal verbs for talking about communication. Go ahead and do the quiz and the writing exercises to practice using them. If you liked this lesson, register for the course to get 29 more! I knew my boss was lying to the client, but I didn't ___________ because I was afraid of losing my job. It's annoying when people ___________ because they don't think I understand English. The gym teacher ___________ the rules of the game so that all the kids would know how to play it. Steve is really into astronomy - if you can ask him, he can __________ the names of all the constellations. When my doctor told me my cholesterol levels were high, I __________ and admitted I hadn't stuck to my diet. I can't stand people who are always __________ problems, but never offer any solutions. We work for an organization that ____________ the rights of indigenous people to stay on their ancestral land. Here comes Sophia - don't _______ that you know about her pregnancy; I don't think it's public knowledge yet. When I was debating whether or not to buy the product, the salesperson ___________ that it would actually save me money in the long run. I can't concentrate on my work with the noise of the construction outside - it's impossible to _____________. Describe a time when you had to fess up about something you did. Have you ever stood up for someone (or had someone stand up for you)? What was the last thing you ranted about? Have you ever blurted out something that you later wish you hadn’t said? Describe a time when you saw something wrong and spoke up. Do you know anyone who tends to harp on a particular topic? Want to get corrections? Write your answers here and send them to me.